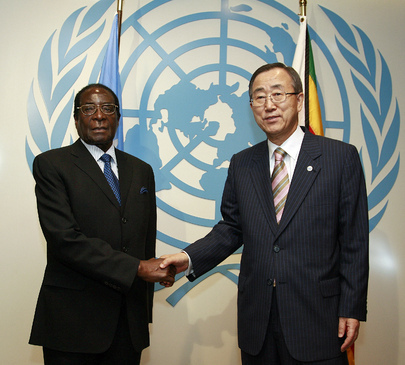 UNITED NATIONS, November 27 -- The UN let the Zimbabwe regime of Robert Mugabe take a cut of all aid money it raised and, until two week ago, converted at a government-imposed rate at the Reserve Bank of Zimbabwe, two UN officials admitted to Inner City Press on November 26. Catherine Bragg, Deputy Emergency Relief Coordinator in the UN's Office for the Coordination of Humanitarian Affairs, refused to compare the exchange rate the UN accepted from the government to other available rates. "The UN does use the black market," she said. "Whatever exchange rate the government allows us to have, the UN has to use." Video here, from Minute 11:59. Ms. Bragg and OCHA were appealing for $550 million for Zimbabwe in 2009. In 2008, using but not disclosing Mugabe regime dictated exchange rates, the UN appealed for $400 million, and raised and spent $300 million. Earlier this year, Inner City Press exposed the UN's loss of 20 to 25% of money raised by the UN and spent in Myanmar after Cyclone Nargis as the UN allowed the Than Shwe military government to require conversion of dollars into government Foreign Exchange Certificates. Click here for that. At that time, Inner City Press asked OCHA chief John Holmes, as well as the spokespeople for Ban Ki-moon, UNICEF and the UN Development Program to disclose any other countries in which the UN system was losing 5% or more to government require currency exchange. The responses ranges from "there are no such countries" -- which is now shown to be untrue -- to "we don't need to tell you." This latter approached was continued four months later, by Ms. Bragg and Ban's spokesperson Michele Montas. Ms. Bragg refused to compare the Zimbabwe rate up until two weeks ago to the exchange rates others were able to obtain. Ms. Montas after a back and forth with Inner City Press said that even the UN's unofficial information on exchange rate losses "will not be available to you." Video here, at Minute 27:35 - in the UN's transcript, her quote is inaccurately transcripts as "will not be valuable to you." The UN's summary of Ms. Bragg's OCHA press conference does not use the word black market, which she used two times, and does not include the unanswered questions in this regard. How could the UN appeal for hundreds of millions of dollars while it knew that of this aid money it was losing high percentages -- 25% in Myanmar, an unknown percentage in Zimbabwe and other undisclosed countries? Inner City Press: And also I wanted to ask you, there was a press conference here at 11 by OCHA about Zimbabwe, the scope of which was explicitly Zimbabwe only… but an issue that arose was when, the UN, apparently up until two weeks ago when they converted donor dollars in Zimbabwe, they received a foreign exchange rate significantly lower than the market rate. But, they said that they were unwilling to compare the two, because the UN doesn’t do business “on the black market”. Is it, does the UN, I guess, if it’s spending donor money, is some attempt made to see that in fact the money is not just being lost to governments like, in this case Zimbabwe, or what happened in Myanmar. What safeguards are in place to make sure that money is not being lost to governments when they require conversions of funds with them? Spokesperson: Okay, what we are also concerned about is not going through illegal channels. And the UN cannot afford to go the black market. What Ms. Bragg said was true. In terms of trying to find the best rates, as you know, they negotiate in every single country where the UN operates. So, short of going through the illegal market, we are doing what we can to try to get the best rate we can possibly have. Inner City Press: I tried to ask Ms. Bragg if the UN had compared other rates available other than the one they were getting from the government and she said, no, we only take one with the government. So how would, how would the UN know if it’s getting a good rate or not if it doesn’t, I guess I’m, maybe the question to you or to OCHA is, what has been the spread between what other people get as an exchange rate and what the UN gets from the government? Spokesperson: I don’t have that information. If Ms. Bragg could not give to you, I don’t have it. Inner City Press: She said it was a matter of policy. They won’t even say what the comparison is because they don’t want to talk about a “black market”. Spokesperson: I understand her point. Inner City Press: So, I go back to this. With these cap appeals that come out, how is there any way to know how much of the money is being lost in government foreign exchange conversions, if the UN has a policy of never comparing the rates. Spokesperson: Well, the situation is that we are an intergovernmental organization. You have to take into account the legal government that is in any country, whether there are problems or not, of course. The policy is trying to find the best rates, but within legal ways. Spokesperson: In some countries it’s not a black market. It’s a competitive market. Then the UN tries to get the best rate. Whenever you have a government-controlled system like this one, the UN does not have a choice. Spokesperson: I’m sure they are aware of it. Inner City Press: Then why wouldn’t they disclose them? If they just asked the international community for hundreds of millions of dollars, if the UN knows how much is being lost to the Government, why would it be against the policy to say…? Spokesperson: Because they cannot officially take into account the black market. Inner City Press: Could it be done on some unofficial basis? Spokesperson Montas: It’s certainly done on an unofficial basis. But it won’t be valuable to you. This last transcription is significantly and seemingly intentionally inaccurate. As the video shows, Ms. Montas says, "it won't be available to you." Video here, at Minute 27:35; the Q&A starts here at Minute 24:30. After Ms. Bragg's formal press briefing, Inner City Press asked OCHA's country leader Rania Degash if she could speak about the exchange rate losses. No, she said, saying that the UN Development Program had been in charge of it. Another correspondent muttered, this is so secret, what is it, the CIA? But even that agency is overseen to some degree by a legislature. Who oversees the UN? The ethically-compromised Inga-Britt Ahlenius of OIOS? No one, apparently.